Cavities appear when some acids deteriorate the tooth enamel. These acids are produced by a bacterial biofilm. The plaque contains germs that receive nourishment through sweet substances. The digestion process of these sweet substances leads to the creation of the acids that attack the tooth enamel. Over time, acids can produce cavities on the tooth enamel, also called caries that if left untreated can grow and destroy the tooth. If you think you can have a cavity, come to Dentalmad. 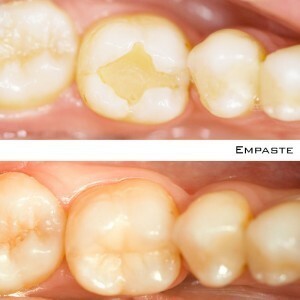 We will fill the cavity in order to stop the development of the caries. Teeth are constantly subjected to the attack of acids. Despite this, caries do not appear immediately, because other elements from your mouth act as a reinforcement of teeth, stopping the formation process of caries. One of these elements is the saliva, which contains minerals that reinforce the tooth enamel. Fluoride, which is a mineral that is added to water and is also present in some toothpastes, helps reinforcing your teeth.